Schumer Bros. originated in 1948 as a partnership between brothers Norbert and Leon Schumer. The business incorporated in 1958 with Norbert as president, Leon as the Vice-President and Donald Wibbenmeyer as the Secretary-Treasurer. Since that time, the business has grown from its original location in the basement of a garage to our new location at 821 N. Kingshighway, Perryville, MO. 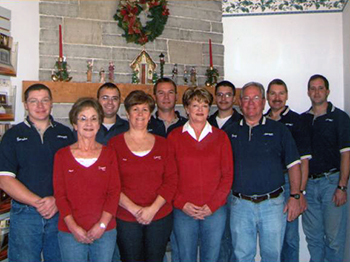 Over the years, Several of Norbert and Leon’s children have worked in the business with the reins as President being turned over to Norbert’s oldest son, Gary, upon Norbert's retirement in 1985. Leon retired in 1990 and is enjoying life on the farm. The current Vice-President is Doug Schumer, Gary’s son, and the Secretary-Treasurer is Sharon Moonier, Norbert’s daughter. The current crew is a very dedicated and conscientious group. We strive to be the best at what we do in sales, service and installation. We offer a variety of products and services including plumbing, heating, air conditioning, duct cleaning, fireplaces and gas grills. Our current location has a very nice showroom with several display units. While we service all brands of heating and cooling equipment. We specialize in high efficiency Trane and Water Furnace equipment. We stand behind everything we sell with a 100% customer satisfaction guarantee. We have learned over time quality doesn't cost, it pays. To provide the highest quality in installation and service of plumbing, heating, air conditioning and gas appliance by using the best products to meet the needs of both the residential and commercial markets. Retain, attract and develop dedicated people who are committed to their own growth, the growth of Schumer Bros. Inc., and 100% customer satisfaction. Build a quality service division to maintain good customer relations. Maintain a mutually profitable and satisfying relationship with our wholesalers and suppliers. Seek the best contractors to work with in the new construction and remodel markets. Develop and maintain a training program to ensure quality installation and service. Develop and maintain written policies to cover all areas of the companies operations. Thank you for taking the time to read about us. If you have utilized our services in the past, please accept a big “Thank You” from all of us. If you’re considering using us in the future, Thank You in advance.